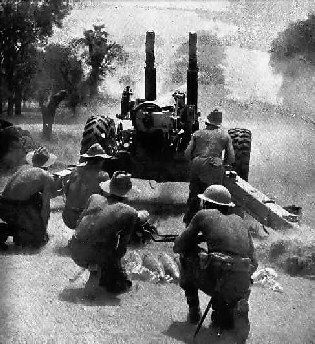 The break-out from Imphal occurred in late June 1944 and after a terrible mauling the Japanese began to pull back south through Burma fighting all the way, with the triumphant allied forces, including 113, on their heels. 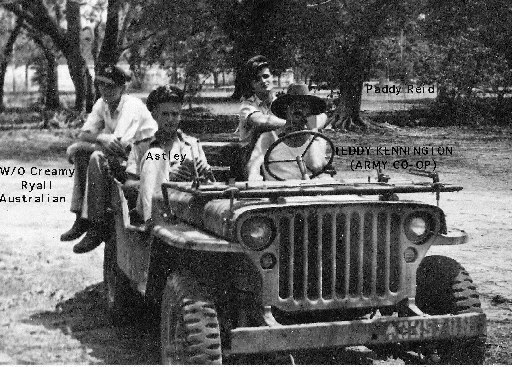 F/Lt Stanley Chilton D.F.C : In late June came the turning point in the Burma campaign, when, after fierce fighting at Kohima, some 60 miles north of Imphal, to which 113 gave support, the 14th army regained control of the Manipur road and the siege of Imphal ended. Among the first convoys to reach the valley were some lorry loads of (free) beer! During the siege one had seen relatively little of Japanese aircraft, but they did exist and records showed that 33 were destroyed by the RAF, 20 probably destroyed and 60 odd damaged. Allied losses amounted to 75 aircraft destroyed and many more damaged. 113's losses were, of course, mainly due to ground fire, but some of the pilots managed to survive. Although the siege had ended the war of course went on and in July, Japanese troops infiltrated the Palel dispersal at night destroying 7 aircraft (3 Spitfires, 2 Hurricanes and 2 Harvards) using delay charges. ( sticky bombs) This was about half a mile from 113's sleeping quarters ! While the grave danger may have passed, the 113 remained busier than ever having flown 572 operational sorties during July and increased their work month by month to a massive 800 plus in October! 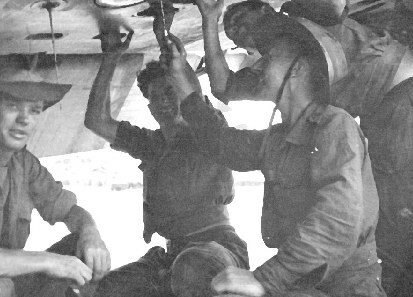 This despite a chronic shortage of pilots, a chronic shortage of spare parts and the impossible task of ground crews keeping old battle worn aircraft serviceable for quick turn-arounds in absolutely appalling climatic conditions. A quite remarkable and staggering achievement. The spirit of the squadron never faltered despite there being little in the way of entertainment to relieve the monotony of work, but one extraordinary event recorded officially is worthy of mention. On 26th. August, 1944 the squadron Welfare Officer, W/O Williams `returned from Calcutta with drums, an accordion and a trumpet - the beginning of the squadron band'. Shortly afterwards a violin and saxophone also arrived, as did a `good pianist' among the replacement personnel and there was hope of some live music. Weather this materialized is not recorded but during this period there is also official mention of `a gramophone recital of classical music in the Airmens' Dining Hall'. A fine example of culture amid the chaos of war. According to pilot F/Lt Stanley Chilton D.F.C, it was also a time for some off -base R&R as well: With the pressure eased a little the pilots could now enjoy the luxury of going on leave, either using a Harvard which the squadron had acquired or scrounging a lift in a Dakota. We normally went to Calcutta where we stayed in Aircrew House, and we spent most of our time eating, drinking, sleeping (in a decent bed) swimming and other diversions. Two pilots would fly to Cal and two others would fly back bringing a load of Indian Gin and Rum, which we drank with orange squash.The more adventurous, took the train up to Darjeeling in the Himalayas where, in the cool air, we could wear our 'best blues', which had been in store in Calcutta. These diversions apart, the bombing and strafing went on relentlessly with the targets getting further away as the Japanese retreated. They were now in less mountainous country and thus easier to find. On the longer trips we were given Spitfire escorts (the Hurricane was no match for Japanese Oscars) much to the Spitfire boys amusement. Despite the fact that the Japanese were now on the run, the stress of continual operations combined with flying under horrific conditions still continued to take its toll in operational losses and accidents. One such occurence is described by F/O Colin Ellis: On 20 November 1944 we were briefed to attack INGON, a village east of the Chindwin River, a Japanese base for troops and stores. Approaching Kalewa, we were now over Japanese occupied territory, 'A' Flight Commander ordered the change from Flight formation to line-astern. Nearing completion of the manoeuvre there was an almighty thump behind and the controls went comptetely stack, in fact my tail-ptane had disappeared. After some effort I managed to bale out and landed in the trees of jungle covered razor back hills. My aircraft had crashed and exploded a short distance away. l smartly left the area not knowing if the Japs were about and after a time stopped to check my kit. At the time of briefing back at base, I went to my locker and found that my parachute had been removed for routine repacking, so I borrowed the nearest chute. I was 5'6" tall and the pilot whose parachute I had borrowed must have been over 6'0". Consquently, when I baled out and pulled the rip cord, the shoulder straps fell off and I decended head first. My feet fortunately caught in the lower straps. Being upside down, I watched several items fall away including my escape pouch containing money, maps etc. Using the escape kit issued to all pilots, I planned a route across the range of hills, avoiding paths etc, and after 5 days walking reached the lines of our advancing troops. It was only when the Army Intelligence Officer who debriefed me mentioned that they had been asked to look out for 2 pilots, that the realisation came that a mid-air collision probably resulted in the crash. When I returned to Palel I learned that WO Lofty Ball was the other pilot and to my knowledge the crash site has never been found. F/Lt Chilton DFC Continues: By December 1944 the targets were getting out of range so the squadron, now under C/O, S/Ldr. Rose, moved to a new airstrip called Yazagyo on 19/12/1944, about 100 miles to the south, which was actually in Burma. The airstrips from now on did not have proper runways, but were lengths of fairly flat ground, bulldozed level and covered with pierced steel planking. The pilots and ground crews had also given up the straw 'bashas' of Palel, for tents and swapped 'charpoys' for campbeds! 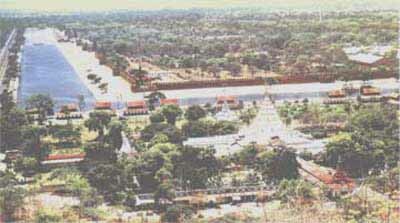 The next major operation for 113 was to support the crossing of the Irrawaddy river by the 14th Army. The only bridge across this river was well to the south, so the crossing was by boat. There was intensive air support by numerous squadrons, including Thunderbolts and B25's, with Spitfires providing air cover. A sort of mini second front. The army was advancing fast now over the central Burma plain and the squadron moved first to Onbauk on 23/01/1945 and then to Ondaw on 14/03/1945. Now, after continuous combat use for over a year in tropical conditions, the Hurricanes were rapidly reaching the stage where a replacement aircraft was essential if 113, and other squadrons in a similar plight, were to remain effective. F/O Colin Ellis comments on this period: The Squadron moved from Onbauk to Ondaw, then to Kwetne where we carried out the last Hurribomber strikes before converting to P47 Thunderbolts. My last Hurricane operation was on 4 April 1945 to B/S bunker positions in the village of legyi. The last operations with the old aircraft were carried out on 05/04/1945. With the arrival of the P47 Thunderbolt, the squadron was withdrawn from action to Wangjing for conversion to this new type. While the above would seem to indicate that the switch to Thunderbolts was total at this time, this was not so and as late as August some personnel continued with Hurricanes.